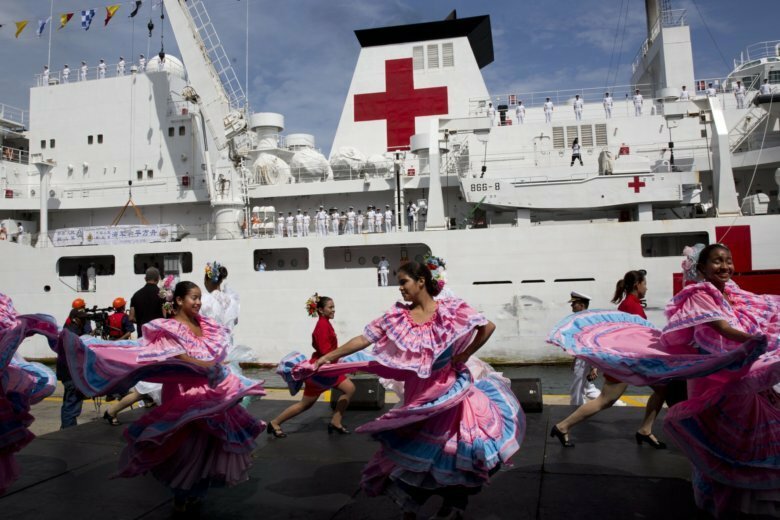 LA GUAIRA, Venezuela (AP) — A Chinese navy hospital ship docked near Venezuela’s capital on Saturday as the OPEC nation’s deepening economic crisis garners the attention of the U.S. and other world powers. Defense Minister Vladimir Padrino was on hand to greet the People’s Liberation Army Navy’s ship, the Peace Ark, on its latest stop as part of the 11-nation “Mission Harmony” tour announced in June. Interest in the goodwill visit has been building since the Pentagon announced in August it was sending its own hospital ship, the USNS Comfort, to neighboring Colombia to provide free medical treatment for thousands of Venezuelan migrants fleeing their homes amid widespread food and medicine shortages. U.S. Defense Secretary Jim Mattis, in a visit to Colombia last month, called the ship’s deployment a humanitarian mission to deal with the fallout of President Nicolas Maduro’s mismanagement of the economy. The United Nations estimates that 2.3 million Venezuelans have fled the crisis-torn country in recent years, mainly to Colombia, Ecuador, Peru and Brazil. But top officials in Venezuela’s socialist government saw the Comfort’s deployment as a threat, part of an effort by the U.S. to pave the way for a military intervention on humanitarian grounds. The Peace Ark’s humanitarian tours around the world have become a sign of China’s outreach efforts and Beijing’s ambitions of gradually expanding its military influence abroad. The ship, which has 300 beds, eight operation rooms and a medical helicopter, has carried out such missions to more than 40 countries provided free medical services for more than 180,000 people since it was commissioned in 2008. Such goodwill visits have been the mainstay of U.S. diplomacy in Latin America for decades. The Chinese ship has twice before visited Latin America, in 2011 and 2015, but never has stopped in Venezuela. It will also visit the Caribbean island of Grenada and Ecuador on its current deployment. Maduro, who came back a week ago from a visit to China where he sought fresh investment and financing from one of Venezuela’s top ally, said on Twitter that the boat will stay in Venezuela for about a week.